U.S. President Donald Trump has declared that North Korea is no longer a nuclear threat. In a Twitter post after returning home from his historic summit with North Korean leader Kim Jong-un in Singapore, Trump wrote "Just landed - a long trip, but everybody can now feel much safer than the day I took office." Trump added that "Meeting with Kim Jong-un was an interesting and very positive experience and North Korea has great potential for the future!" 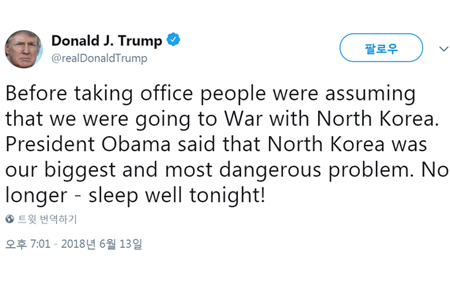 He also said in a separate tweet that North Korea is no longer the U.S.' "biggest and most dangerous problem," telling people that they can "sleep well tonight!" Trump also defended his decision to halt the joint military exercises with South Korea, writing that the U.S. will "save a fortune by not doing war games" -- a term used by Pyongyang for the drills.